Canadians with hyperparathyroidism claim expertise in parathyroid surgery and long wait times as the reasons for traveling to Tampa for surgery. On April 6, 2014, the Calgary Herald published an article about the dramatic increase in the number of Canadians traveling to Tampa, Florida for their parathyroid surgery. This is a great article and should be read, but this blog is our perspective on the problem of why Canadians with primary hyperparathyroidism are traveling to Tampa for their parathyroid surgery in record numbers, increasing every year over the past decade. Traveling long distances for parathyroid surgery is not new-55% of our parathyroid operations are on people who live outside of the state of Florida. We have been a center of excellence for parathyroid surgery for just over 20 years and have seen growth in the numbers of patients with hyperparathyroidism who travel long distances for parathyroid surgery every year. However, the trend for patients with hyperparathyroidism from Canada is different from the rest of the world, with more and more patients from our neighbor to the north coming to Tampa every year at rates higher than any other location. We have three graphs to show this growth and why it is occurring. The first shows the growth in the number of parathyroid patients traveling from Canada to Tampa for their parathyroid surgery over the past decade. The growth in the number of parathyroid patients from Canada exceeds the growth from all other foreign countries. In fact, the growth rate of Canadians coming to Tampa for parathyroid surgery exceeds even the growth of patients from other states in the US. The significance of this is that the Norman Parathyroid Center (Tampa, Florida) is likely the number one place for Canadians to be operated on for hyperparathyroidism. In other words, the busiest parathyroid surgeons operating on Canadians aren't in Canada, they seem to be in Tampa. It appears that the center with the highest volume of parathyroid surgery in Canada is at the University of Calgary (Calgary, Alberta, Canada), where their literature would suggest that they perform about 50 parathyroid operations per year. We surpassed this number in 2013, and through the first 3 months of 2014 we are on pace to operate on 75 Canadians this year. There are no parathyroid centers of excellence in Canada, with almost all patients with hyperparathyroidism having their parathyroid operations at a local or regional hospital by an ENT or general surgeon with no formal training or expertise in parathyroid surgery. Thus, the highest volume parathyroid center for Canadians looks to be a thousand miles to the south at the Parathyroid Center at Tampa General Hospital. When we asked our patients why they decided to come to the Norman Parathyroid Center they gave us three reasons: 1) expertise, 2) wait times, and 3) both expertise and wait times. From an expertise in parathyroid surgery standpoint, every one of our Canadian patients stated that they met with a surgeon in Canada prior to deciding to travel to Tampa. About one-third of these patients saw more than one surgeon and decided that their level of expertise in parathyroid surgery was not high enough and they were not comfortable with the answers the surgeon was providing. Even when being seen at a university hospital, some patients stated that the surgeons and/or staff put too much emphasis on pre-operative scans and because they had a negative parathyroid scan they either did not want to operate (electing to watch the high calcium for a while), or they were told that the operation could take 3-4 hours or more, and that the patient would very likely spend a night or two in the hospital. We are famous for performing the same mini-parathyroid operation on all patients regardless of their scan results. In fact, we tell patients not to get any scans because it won't change a thing we do in the operating room-we want to look at all four parathyroid glands as this is the only way we can assure a near 99% cure rate (see video of this operation that takes 13 minutes). It is very rare for any of our patients to spend the night in the hospital-most leave us about 1.5 hours after the procedure. Most patients from Canada stated that their doctors told them there was a 3-8% chance they could lose their voice following the operation (something that almost never happens when operated on by a parathyroid expert). The graph above shows that expertise in parathyroid surgery is a primary reason for traveling to Tampa for over 90% of the patients who come from Canada, but over the past decade, wait times for surgery has become an ever increasing problem. The third graph looks at the other issue our Canadian friends state is a reason they travel thousands of miles for parathyroid surgery in Tampa: Wait Times. In 2003, just a third of Canadians traveling to Tampa for parathyroid surgery stated that wait times in Canada were a main reason for electing to pay for surgery themselves, forgoing the "free" national healthcare system of Canada because they did not want to wait for surgery. At that time, our patients were stating that they were told it could take up to 6 months to be scheduled for surgery. By 2008 that number increased to 81%. And by 2013, 51 of the 52 patients we operated on from Canada stated that the wait for surgery was simply too long in their home country and this was a major factor for them deciding to travel. "Once I knew I had a parathyroid tumor in my neck that was making me miserable (and my husband too! ), I wanted it out! I didn't want to wait a year to feel better!" This is a direct quote from one of our patients in December 2013, but it sums up the feelings and frustrations by almost all Canadians who come to our center for surgery. For the past several months, the patients that we talk to tell us that they are told it could be up to a year before they could be scheduled for parathyroid surgery in Canada. And, they would be waiting for a year to be operated on by somebody with little or no expertise. Needless to say, our Canadian patients are very happy to be in warm, sunny Tampa-for a number of reasons! Cost of Surgery for Patients outside of the U.S.
Lead article in Calgary Herald discusses why Canadians are traveling to Tampa Florida in record numbers to have parathyroid surgery. This blog would not be complete if we did not mention the cost of parathyroid surgery to patients outside of the U.S who will have to pay for their operation. The total cost (surgeon's fees, consultation fees, anesthesia, pathology, radiology, x-ray, hospital, recovery room, etc) is $11,250 US. A few patients from Canada have been successful in being reimbursed for their costs, but most have not. The bottom line is that they want to feel better (and live longer), and thus for those who can afford it, there is no better (or faster) way to get this accomplished. Note that this is cheaper than anywhere else in the world, and actually cheaper than it costs the Canadian government to pay for it. Everybody else will get at least 2, and as many as 5 scans (including CAT scans and Fusion scans), the operation takes 4-5 times longer (operating rooms are expensive), they will use frozen section biopsies of the glands (we don't do this, and each costs about $180), they will measure PTH hormone in the operating room at least 3 times (at the cost of $450-$600 each, and we NEVER do this), and almost everybody will have to spend the night in the hospital (which almost never happens with our patients). It would be cheaper for the Canadian government to send all their parathyroid patients to Tampa and pay for the patient's airfare and hotel. Those of you getting this operation in Canada will understand what we are talking about! 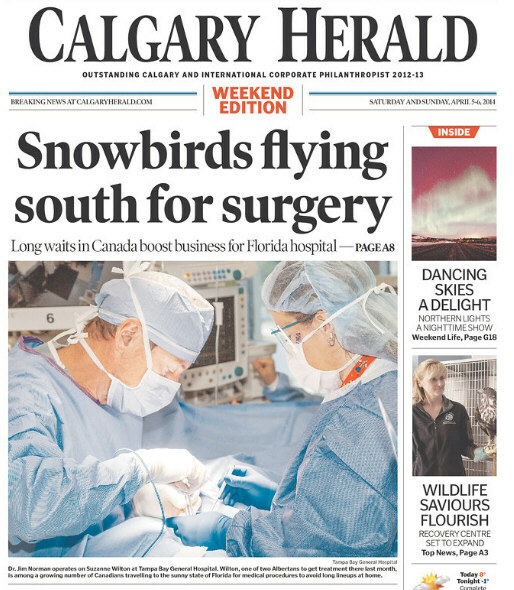 The story of Canadians traveling to Tampa for parathyroid surgery made it to the front page of the Calgary Herald newspaper on Sunday, April 6, 2014. The story discusses the problems several patients had in trying to get parathyroid surgery performed in Canada by 1) an expert and 2) in a timely fashion. The wait times can be up to 1 year or longer if the scans are negative-however we prefer negative scans! Read this very well written article here.